Quick to crochet project to create a pair of boot cuffs for your toddler, or small child. 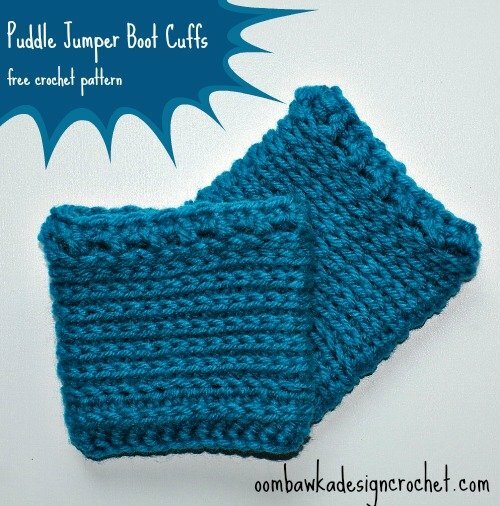 Crochet the Puddle Jumper Free Boot Cuffs Crochet Pattern. 1. The slip stitch and ch 1 do not count as stitches. R12: (fpsc, bpsc) around sl st to join, finish off. Red Heart Super Saver Yarn is available on Amazon. Have you seen their Black Light Yarn? I’m glad you like them 🙂 My children love theirs too! I like the “sideways” stitch. My girls wear their boots all the time, and would love these!